Filipino fight fans in Dubai will get a chance to cheer Filipino-American boxer Larry Abarra when he faces Thailand’s Chatpayak Nuenhgkawkawhok in a four round, super bantamweight bout on the “Duel in Dubai” fight card headlined by three of the Philippines most exciting fighters in WBO Intercontinental super bantamweight champion Genesis “Azukal” Servania, WBO International super flyweight champion King Arthur Villanueva and popular junior lightweight Rey “Boom Boom” Bautista. Three four round bouts featuring Dubai-based fighters will spice up the tremendously successful “Pinoy Pride” series which is a joint venture of ALA Promotions and the giant broadcast network ABS-CBN and its widely watched global network TFC or The Filipino Channel. The Filipino Times in Dubai reported that Abara who was abandoned by his parents doesn’t know much about them except that his father was a Black-American who was stationed in Subic Bay naval base in Olongapo City in the 1980s while his mother who was from the Visayas worked at the “Rolling Stone” bar. Larry was adopted by Bienvenido and Mamalie Abarra who took good care of him as well as two other abandoned kids they took care of despite their economic hardships. The Filipino Times said that at 16 Larry got into boxing after a foreigner spotted him and noted his potential and eventually trained him. Abarra made it to the Philippine national team but some seven months ago he decided to follow his girlfriend to Dubai where he now works as a trainer at the well-appointed Round 10 Boxing Club. 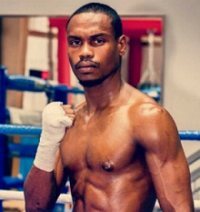 In an incomplete record of his ring career, boxrec.com reported that Abarra has a record of 2 knockouts in 2 wins with 2 losses and one draw when he fought in the Philippines. His last recorded fight in the Philippines was on September 21, 2012 when he battled tall and tough Danilo Gabisay and dropped a six round split decision. Gabisay is the same fighter who scored a surprise knockdown against undefeated Dave Penalosa last July 26 at the Mandaluyong City Gym but eventually lost by a 5th round TKO. While there is no information on Abarra’s Thai opponent, he is grateful for the opportunity to fight on such a big card as “Pinoy Pride XXVII” which will give his friends in the Philppines a chance to see him in the ring on the TV coverage of the giant broadcast network ABS-CBN “live” on pay-per-view in the Philippines as well as on a delayed telecast over Channel 2 and ABS-CBN Sports and Action.